Product Overview With richer reverbs and a Mix knob that goes 100% wet, the Immerse Mk II is our best-sounding reverberator to date. Delivering the same no-nonsense flexibility as its predecessor, it’s more user-friendly than ever before. Experience studio-quality tone in a pedal that can be used with instruments of all stripes. 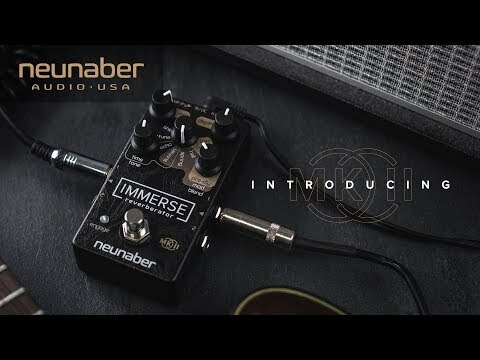 The Immerse Mk II is packed with eight versatile reverb effects, including the new W3T™ and Sustain effect. Features • W3T (Wet version 3) — exclusive to the Mk II, our new flagship reverb is smoother and more three-dimensional sounding than ever before. Now with adjustable pre-delay, it enhances what you play without covering it. • Plate – Bright and diffuse like a studio plate reverb. • Hall – The lush, open sound of a concert hall, now with adjustable modulation depth for achieving deep modulated tones. • Spring – The distinctive twerp of a tube-driven spring reverb. Now with adjustable modulation speed, it can achieve a vibrato-spring sound. • Sustain – A new algorithm built on the W3T reverb. This magical, versatile effect can be configured as a sustainer or infinite reverb. • Echo – Combining the W3T reverb with stereo echo. • Detune – Adds a detuned double of the dry signal with reverb, now with true blend control between detune and detuned reverb. • Shimmer – Reminiscent of a synth pad that follows what your instrument plays, this effect combines the best qualities of our previous shimmers.